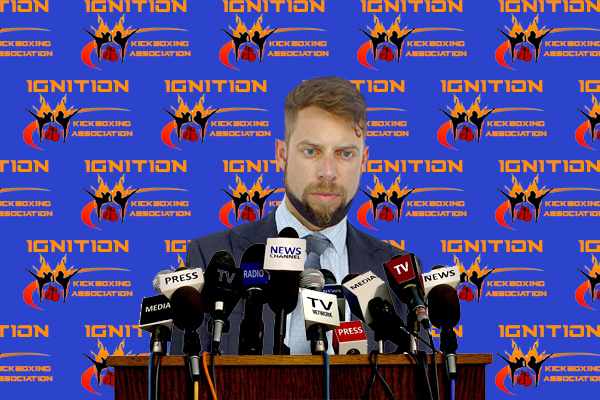 Welcome to Ignition Kickboxing Association. We are a New York based 336K+ restricted KT company looking to build the next generation of KT fighters. The owner of this organization has ran Demonic KT, Demonic Clothing, and was a very active member of Lumpinee KT. We created a restricted KT to give all the fighters the same starting chance. All initial contracts for the time being will be 3 fight, 2k/2k/2k. Once we have some events going and fighters need resigned we will adjust accordingly. We will have write ups, custom belt, posters, and even the very first winners of each division will get a custom trophy. Will Brawler: Hello ladies and gentleman, Special thanks to all of the News and Media that have come out today for our very first press conference. I set this conference to just go over the rules of our organization and to let all those aspiring kickboxers out there know that we are starting to send contracts! Just reach out to me and I will ensure to get you on our roster. Media 1: Are you going to be signing the best Kickboxers known to the tycoon world? Media 2: When is your first event? Will Brawler: If you all will wait for a few minutes, all will be answered soon. As for our signings we are a 336K+ Restricted organizations so that all our talent are on the same skill level. Unlike other companies we will not be stacking our Main Events with single contract matches. We will be building all our own homegrown talent from the start. As we grow we may try to work on some Special matches putting Top MMA guys against Top Kickboxers in Kickboxing Rules matches. All matches will be under Kickboxing Rules in a Ring. We will be announcing our first event soon with many to follow. So does anyone have any questions??? does anyone have any questions??? Will you do like every kickboxing promotion do and limit the number of thais competing so they don't take over every weight class below 170 pounds? Will you adopt a ruleset that avoid knees and elbows to protect western fighters from the thais? Will you adopt a ruleset that limits clinching to protect western fighters from the thais? I can't wait to get the fights started. will you be doing a creation tournament to get things going, would be highly interested to join and create a fighter for it. Will Brawler: Regular John, To start off with, Yes we will be limiting the number of fighters per class however the number is not known at this time until our contracts start being signed. We are in the process of creating a Creation Tournament for our 205lb and 185lb tournament along with taking entrants for our other divisions. We have just hit the 337K mark in Tycoon and thus allow a reasonable amount of potential fighters for our company. We are staying 336K but being a kickboxing Org allows for a better chance. For the time being we are following standard tycoon kickboxing rules, basically all standup allowed. Ignition KT is looking for fighters. We are a 335K restricted organization and looking for all divisions. We are also hosting a creation tournament with details available here. Contact us today if your interested in the creation tournament or just having a fighter be part of the KT organization. Hermann "The Ghost" Van Glost (337440) is a light heavyweight Schizophrenic kickboxer from Denmark, he would like to join. I have a 335 guy just fit for this. sad. Sorry, We put the restriction on to have everyone start at the same level essentially, a 335K guy has the potential to have trained alot longer than a 336K guy and we want all our fighters to start roughly the same level. We may look for other fighters for occasional 1 off fights and such depending on how our talent builds go however. Throwing my guy into it as well. Contracts sent, First show will also be round one of the Creation Tournament, 8/25 Matches will start to be made soon. Dagestani "Wrecking" Machine (337041) would like to join your 155lb division. Junior Master of KT 3 - Third Strike!! !